Heat oven to 350° F. Spray 12-cup fluted tube cake pan with cooking spray, or grease with butter and lightly flour. In large bowl, mix flour, baking powder, baking soda, salt, cinnamon and nutmeg. Add shredded carrots; toss to coat. In medium bowl, beat brown sugar, pineapple, 4 eggs, vegetable oil and 1 teaspoon vanilla. Add to dry ingredients; stir just until combined. Stir in chopped pecans. In medium bowl, beat Cream Cheese Swirl ingredients with whisk until smooth. Pour half of the cake batter in pan. Spoon cream cheese mixture on top, leaving 1 inch around edges. Spoon remaining cake batter on top. Bake about 60 minutes or until cake springs back when gently pressed. Cool in pan 15 minutes, then remove to cooling rack to cool completely, about 1 hour. In medium bowl, mix powdered sugar, 1/2 teaspoon vanilla and enough milk to make a thick but pourable glaze. 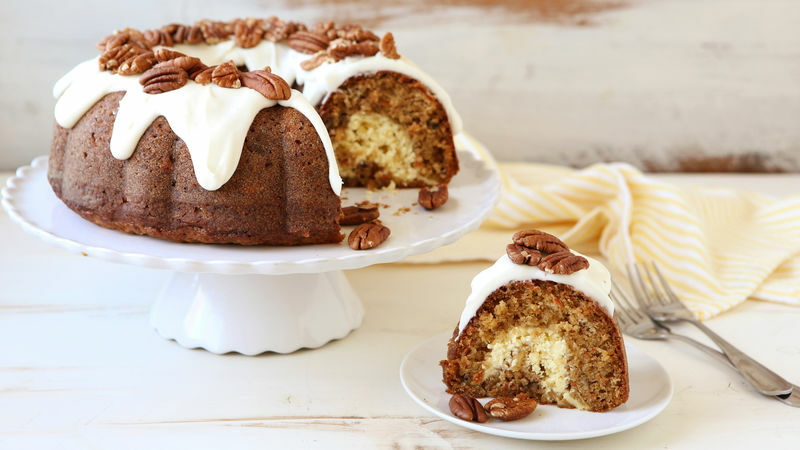 Gently pour over cooled cake; top with pecans. Let stand 30 minutes for frosting to set before serving. Walnuts can be used in place of pecans, if desired. Do not drain crushed pineapple before using.